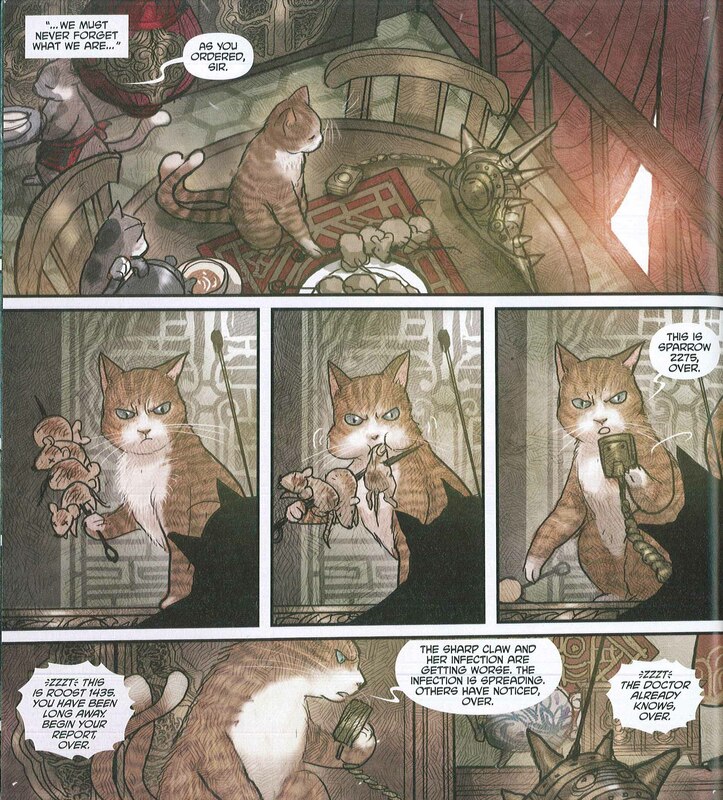 “Haven” is the third and most recent volume of this critically acclaimed series, winner of multiple Eisners (the Oscars for comics), as well as a Hugo and a British Fantasy award. And in an echo of current world tensions, the main characters are indeed refugees. Kippa, the kid with the ears, is looking for a home beneath the layers of allegiances and betrayals in this post-war world. The universe is alt-1920s, matriarchal, and somewhere in Asia. Maika Halfwolf, the main character in the blue tunic, even carries warring factions within her own body. 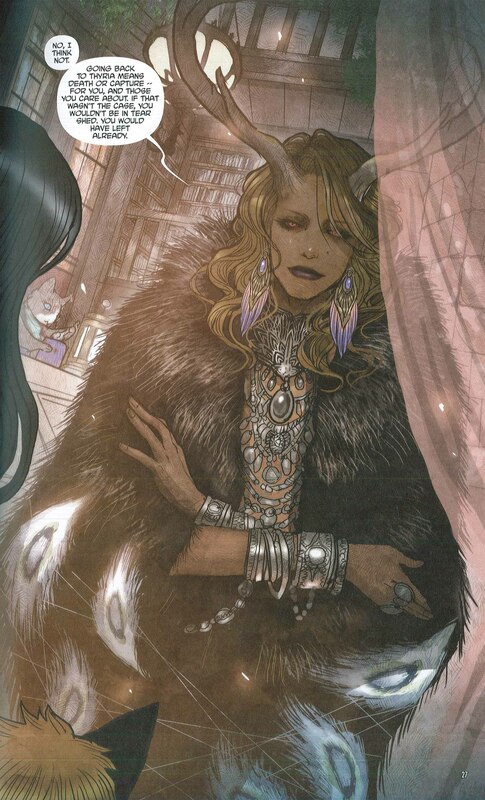 Maika is part human, part wolf, and part “Arcanic”—a race of magical old gods. As far as I’ve been able to figure out, Arcanics are battling against witches called the Cumaea, who eat Arcanics to survive. Since Arcanics and humans are also heading toward a war, much of the tension in the story rests within Maika as she figures out how to negotiate this monstrous being who shares the space inside her skin—and sometimes emerges. 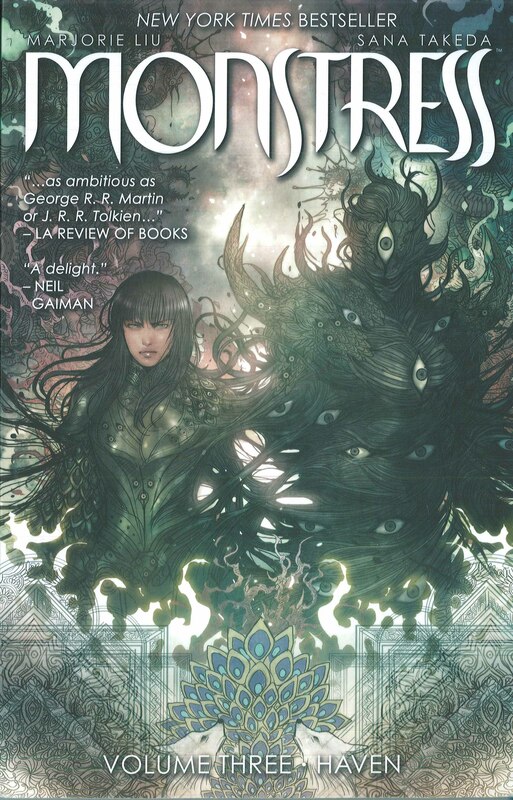 If that all sounds too complicated, the other driving ingredient in “Monstress,” relatively uncommon within the apocalyptic fantasy genre, is its sense of humor. Maika’s monster, for example, is named Zinn, and as their relationship develops, they begin to bicker affectionately, like an old married couple. Rather than internalize and repeat those hurtful and isolating messages, Liu has become an advocate for cross-pollination in her storylines as well as in her life. “Monstress” illustrator Sana Takeda works in Japan. 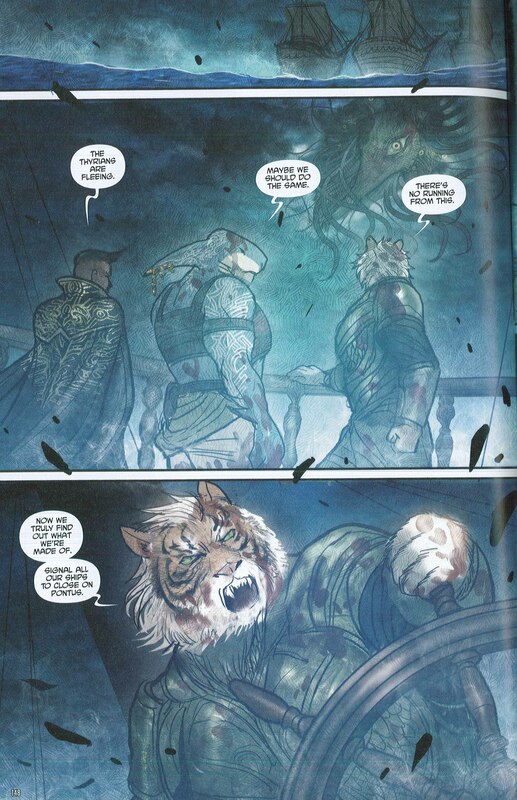 They first met when they were working for Marvel Comics on the X-Men series, and when Liu needed an illustrator for a world of her own, she sought Takeda out. Liu and Takeda need a translator when they’re working out specifics, but they mostly communicate in images. Takeda’s rich mash-up of Maxfield Parrish, manga, and traditional Japanese painting is worthy—as you can see in the cover image—of rendering in stained glass. 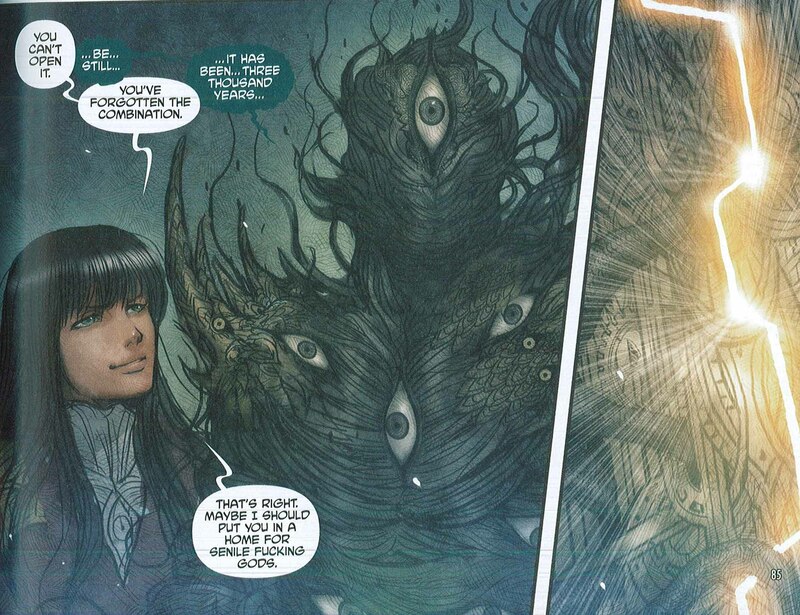 The only drawbacks to “Monstress”? The plotline is so complicated that necessary backstory sometimes hits the page in inelegant chunks. Another notable feature, which may or may not be a drawback depending on your taste—and may or may not be surprising for the winner of 2018’s “Best Publication for Teens” Eisner—the f-bombs average out to about one per page. Liu’s impulse to express explicitly female rage extends not just from her childhood, but from her family history: her grandmother was forced to flee China during World War II to avoid being captured as a “comfort woman,” a sexual slave of the invading Imperial Japanese Army. Yet Liu’s desire to represent this rage and violence arises from an impulse to exorcise it rather than perpetuate it. As she noted in an interview for the “LA Review of Books,” “Even in war, even when you’re forced to do terrible things to stay alive, people don’t necessarily lose their humanity. I’ve always been keenly aware of the fact that even in the most terrible circumstances, compassion can exist. 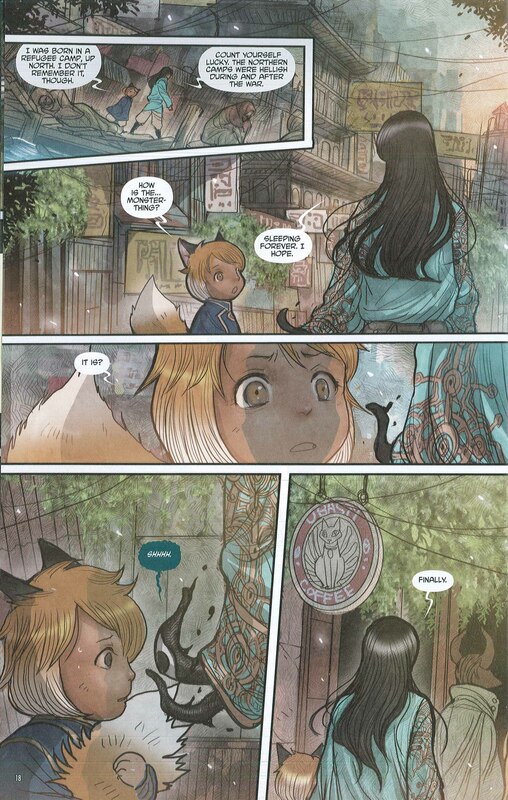 Even when we feel compelled to follow the mob, we can still resist.” Beneath the simultaneously rough and lush exterior of “Monstress” runs a consistent and heartening message: stay human—the best kind of human—even in monstrous times.